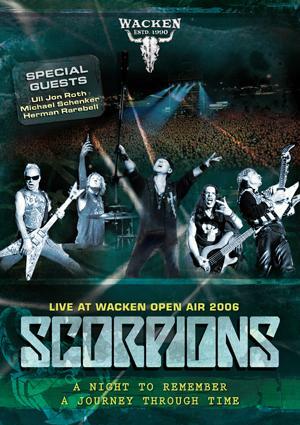 Scorpions - "Live At Wacken Open Air 2006"
Live At Wacken Open Air 2006: A Night To Remember - A Journey Through Time” is the name of the once-in-a-lifetime and legendary appearance of the SCORPIONS at the W:O:A 2006, which will be released on DVD in December 2007. Together with their former comrades-in-arms Uli Jon Roth (guitar), Michael Schenker (guitar) and Herman Rarebell (drums), the band was on its' own trip through history. One classic after the other was celebrated, for example Coming Home, Bad Boys Running Wild, The Zoo, Loving You Sunday Morning, Make It Real, Pictured Life, Speedy’s Coming, We’ll Burn The Sky, Love ’em or Leave ’em, Don’t Believe Her, Tease Me Please Me, Coast To Coast, Holiday, Love Drive, Another Peace Of Meat, Blackout, No One Like You, Six String Sting, Big City Nights, Can’t Get Enough, Still Loving You, In Trance and Hurricane.